Commentary headlined “Rwanda: The Two Faces of Paul Kagame” by Kigali-based freelance journalist Jon Rosen appeared in World Politics Review on May 27. – ed. Jon Rosen’s essay about President Paul Kagame is outrageous – for myriad reasons. Consider just four. First, Rosen mentions only Amnesty International and Human Rights Watch, implying that these two are the Kagame dictatorship’s only critics. Nothing could be further from the truth. It would be similar to claiming that only African-Americans hated apartheid. Second, Rosen glosses over the damning case against Kagame – in the same way he ignores most Kagame critics. Rosen fails to mention that right now Kagame’s regime is shutting down newspapers, is kidnapping the homeless and is demonizing and pronouncing Victoire Ingabire guilty – before her sham trial even begins. And hours ago in Rwanda, Kagame arrested eminent American law professor, Peter Erlinder, who is defending Ms. Ingabire. Nor does Rosen mention Mr. Kagame’s role in Yoweri Museveni’s blood-soaked climb to power in Uganda. And he is silent about their joint plundering of the Congo – the real driver of their invasion. And even though it is published in a global journal, the Rosen essay forgets to mention that Gen. Kagame continues to enjoy more than two decades of American support, that he was trained at American military academies, that his son is now enrolled in West Point, and that he tours the U.S. several times each year. If I appear irritated, please understand why. In Washington’s current relations with Mr. Kagame, we are seeing the replay of a tired old movie. Since 1960, Africa’s year of independence, each and every U.S. administration has praised, financed and kept in power its own set of brutal African strongmen that, in its secret files, it has labeled “friendly tyrants.” Mobutu sese Seko of Zaire, Siyaad Barre of Somalia, Hissene Habre of Chad, Samuel Doe of Liberia and Jonas Savimbi of Angola – these are just five of the dozens. This continuing scandal of official Washington supporting “friendly tyrants” in Africa is the third reason the Rosen essay is outrageous. All this reeks because it continues a tradition of Western elites telling Africans to be happy living under dictatorships that those elites would not tolerate in their own countries for a single day. It is entirely possible that Jon Rosen has a reason. Perhaps to avoid being arrested in Rwanda – as just happened to Peter Erlinder – he is obliged to publish an outrageous, slanted analysis that dismisses the critics and pooh-poohs the damning case against Kagame as a mere “narrative.” If so, that price is too high and Rosen should have walked away from Rwanda. 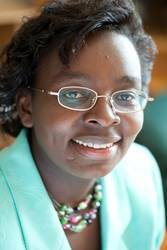 Nii Akuetteh, former executive director of Africa Action and adjunct professor at the Georgetown University School of Foreign Service, is a member of the Scholars’ Council at TransAfrica Forum and founder of the Democracy and Conflict Research Institute in Accra, Ghana, and the Open Society Initiative for West Africa (OSIWA). Contact Mr. Akuetteh at niiakuetteh12@yahoo.com. Nii. Please do your research on the recent history of DRC. If you find that Congolese accuse Kagame of killing Congolese in DRC during the post genocide DRC operation to hunt down the perpetrators, then ride on with your arguments. However, im certain that you will be disappointed and your reputation as a professor in a reputable University in the US, will be put to serious question. You are probably getting photos on the net of congolese demonstrators seeking to authenticate their assylum cases/claims or you simply riding on the propaganda wagon of the genociders, Rwanda is a country seeking for Peace, stability and development. We are glad we are progressing in this direction. Our judicial actions against those seeking to enhance the genocide ideology stems from an unforetunate event that left 1million people slauhgtered and the world looked on shamelessly. something that gave us a reality check " that we need to sort out our own mess". No one is bothered out there! !__We are therefore a careful and resilliant people today, We wont accept critiques to run our political climate especially if they are only academic, with no exposure and/or good intension for Rwandese. @rwivanga: "Rwanda is a country seeking for Peace, stability and development." If this is true, why does the army seem to be the largest, most influential institution in the country? And, how can minerals have surpassed agriculture as a source of export revenue, when Rwanda has no mineral deposits, except by plunder of Rwanda's neighbor, the eastern D.R. Congo? @ Ann, do you seriously think that your opinions are credible, when surrounded by people who are directly connected to Victoire or Erlinder? I mean, you have every right to be their friend and to take their point of view, but please spare us your "expertise". What counts is if you HAVE been to Rwanda and if you HAVE been unbiasedly exposed to all views. As for now, you seem to copy paste what Erlinder and friends are writing. In my eyes, you are not a credible author, really sorry. You are as credible as an advisor to Kagame, a media spokesperson of Mugabe, a ghost writer of Obama, the best friend of Berlusconi or the cook of Sarkozy. Keep on writing, but don't make a fool of yourself by pretending to be neutral, yet knowingly (or unknowingly) functioning as the useful Mzungu propaganda mouthpiece of people who have an agenda probably (and hopefully) not yours. To defuse my doubts, it would be great you would openly explain what makes you so interested in the Rwanda issue, as of 2010. In response to the preceeding postings, I've this to say. Indeed, the ICT revolution has brought us many positive and developmental things, but it has also posed some major caveats. You could be a criminal on the run and then fool the whole world around that you're being pursued by your enemies because of your 'goodness' and their 'badness'! You could also take the initiative to abuse anybody, any institution, a people, a nation … and get away with all the uninformed/misinformed, if not deliberate and calculated vile, deceptive, malicious, vicious, corrupt (and, name it all) propagandist discourse, or in other words a bin of trash/garbage that your readers will feed on. Might I add that some folks can also use Google-journalism and pretend they are experts on certain subjects, such as Rwanda, even though they've never once tasted ubugari for themselves…. Wow. I thought Jon's piece was fine. Not perfect but still an excellent piece of journalism. Please let's go easy on Ann. She calls it like she sees it and her writing is a pretty accurate reflection of one side of of this argument. I will never be even try to be an unbiased reporter, for example, I am biased against killing innocent children or torturing puppies, etc. Though I STRONGLY AGREE with Erick and the suggestion that reporters–all journalist whether with complaints or compliments about the current situation in Rwanda–before writing about Rwanda should first go live in today's Rwanda for at least a year or two. I takes that long to "get it". To make believe, some posters (or impostors?) accredit themselves as highly placed personalities: university professors/academics of high ranking, clergy, seasoned international lawyers and politicians, blah, blah. When you read them at first glance you can easily get infatuated with their toxic ideas, if you aren't information literate, and many Rwandans and other nationalities are continuing to fall prey to these heartless, dehumanized and even 'devilish' (I daresay) pretenders to human intelligence, wisdom, technological craft, democracy, etc. For me, if anybody can't see the human and moral catastrophe that has befallen Rwanda in the form of the Genocide against the Tutsi, or other Genocides that other peoples of the world have been subjected to, for that matter, that is not a 'human being' in our midst. He/she ought to be ostracized. Period. And giving such people fora to air their diabolical ideology is not only a crime against humanity but a moral abomination that cuts across races, continents, nations and all shades of social class, and creed/faith. To come back to the nexus of the theme argued about above, I would like to abhor in the strongest terms the views, opinions, sentiments, biases…, expressed by Nii, the author of the article that was his/her focal source of the current discussion, and to some extent Ann Garrison – although I somewhat sympathize with the latter. She seems to be underinformed, and the questions she poses could be genuine 'research' questions anybody could ask out of curiosity, or something like that. But, with all the respect for the inputs from Ann, Rwivanga and Eric, I would like to ask Ann a couple of questions: You claim/allege that the Rwandan Army (now known as "Rwanda Defence Forces" [RDF]) as an evoulution from "Rwanda Patriotic Army" [RPA]) seems to be the largest institution in the country! Is this your authentic observation just by headcounting file and rank, and if so, how would one trust your statistical method? Or, do you have any other source that would prove to the reader that this is a trustable, valid and reliable claim supported by statistical certainty (at least some measure of it)? Secondly, even if your projections/speculations were anything to go by, I don't see clearly any correlation between the size of the Rwandan army and the mineral wealth you claim Rwanda has been digging out of Congo. I am not a military spokesperson, neither am I a politician as such, but I know for sure that the larger number of soldiers you see on the Rwandan military landscape are just patriotic people who have committed their lives to the wellbeing of their nation and people: security, peace and stability. They have to suffer for it, as I know that they are poorly looked after in terms of salaries, care and other incentives that would motivate a 'worker' of the people, a slave, something that most people in the 'mzunguland' of today cannot afford to do . But they still do their job because they know well that their country has economic problems and is unable to treat them like the military in Europe, the US, etc; so they're perseverent, enduring and resilient. Therefore, Rwanda has no rich or otherwise privileged army whatsoever, and I don't see where the mineral wealth you claim is linked to their size. I think their size is a strategy of preparedness, just like any other nation has its own preparedness – military or non-military. Coming back to the issue of Congo's mineral wealth, I usually get more than irked when somebody from the developed world, especially Europe or North America, makes claims that Rwanda, Uganda, etc, sister countries to the DRC, have been plundering the latter. I don't want to make judgemental pronunciations against either Nii or Ann as such, but I am inclined to conclude that Nii might be a direct beneficiary of the Rwandan Genocide ideologues (or at least a sympathizer or subscriber) and that Ann is just an interested reader caught inbetween the propagandist media that at the moment seems to favor and damn certain voices. I do sympathize with her because it really matters which voice is aired and heard, why, by whom, where, and when. I don't really want to go deep into this issue of plundering the mineral (or other) wealth of a sistery/brothery nation like DRC by Rwanda or Uganda. I don't want to condemn or defend some individuals from these countries who might have ventured into that plundering crime, as I haven't any concrete proof. All I know is that many things are possible. A challenging question I would like to ask both Nii and Ann, however, is: Are you 'literate' to the goings-on of Congo's plundering in succeeding historical epochs/regimes to date? Just to remind you, I will state the regimes and then you conclude who was plundering the Congo under them, of course, in concert with selfish, good-for-nothing Congolese leaders and 'crooks' turned into business people: Belgian colonialism; Mobutu Seseseko Ngwendo wa Zabanga; Desire Kabila; Joseph Kabila. During the Mobutu regime, who plundered Congo? Where was Kagame; where was Museveni, and other 'small' guys, compared to the 'big' guys who were robbing Congo? After Mobutu, these 'small' guys have come in, I think primarily because of their political and military strategies, but I can't rule out they eyed the wealth, anyway, because, after all Congo has been such a good source of plunder/robbery, and the 'mzungu' has been robbing it unprevented, unhindered, unchecked, uncontrolled, all alone. So, why not the prospect of taking a share, at least of the smallest 'animal', as the 'mzungu' has been taking a lion's (if not an 'elephant's') share? But the 'mzungu' doesn't like sharing; he/she wants a lion's share because he/she is so greedy, a sacred share, he/she thinks. So, this is one of the factors that is putting Kagame and Museveni into bad books with Europe and North America (to some extent) – because the former have also expressed an interest to 'eat' from the Congo plate. This is the truth 'you' propagandists like Nii don't tell the world. That Kagame and Museveni might have come in as competitors against an insatiable gang of plunderers and robbers in the form of Belgians, the French, Americans, etc. Still, I am not saying the two men, Kagame and Museveni, have necessarily done any plundering. It could be the propaganda to divert public attention from who the real plunderers are. 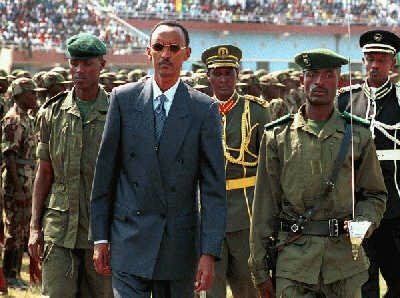 Another revealing thing that you don't want people to know by damning Kagame is that in the wake of the battle against the Genocide ideology and all its artifacts which we still have in our midst, Kagame led a war against Genocide and is still leading it. As a dialectical manoeuvre to deviate the good and dominate it with evil, you try to frustrate the noble efforts of Rwandans to identify themselves positively, leaving behind their macabre history and burying their hatchet, and, instead, you aid in perpetrating the same deja vu genocide ideology by negating and/or revising it. As if this is not enough, the 'mzungu' and some other greedy foreigners including fellow Africans are still 'trading' with FDLR who of late have been plundering Congo's natural wealth. So, why don't you talk about them? A person like Nii seems to exhalt the genocidaires to a pedestal they don't deserve at all, perhaps because he is on their payroll, money they obtain out of plundering Congo and carrying out illegal business across the globe with greedy, self-seeking, humanless, fellows. That is why they (FDLR and other genocidaires like them) still have a voice. If they were stopped to plunder Congo they would have no voice. But because Kagame is stepping on their and their protectors' toes, he is their 'enemy', so they must detract him. A look at the poster/placard above reading "3 million children dead on Kagame's orders" should tell it all to any rational human being across the globe! Even the likes of Hitler, Idi Amin Dada, Bokassa, Habyarimana, etc, have never been charged with such a scale of atrocitous abuse of God's dearest creation, and, afterall, kids! Gosh! Which sane man or woman would believe such trash as portrayed in the demo? To see Kagame being welcomed, hailed and honoured as an exemplary leader around the world proves what I have stated above. Would Kagame be in position to hypnotize the world so as not to see such a horrendous crime he has committed against humanity? Even you propagandists, I think you sometimes underrate people's intelligence. It takes one to be a child, a fool, a mentally unstable person, to not see through a 'white' lie that one! Lastly, I don't want to be an apologetic for Kagame's mistakes or failings as a human being or during his tenure of office as the President of the Republic of Rwanda. I believe that erring is human, but forgiveness is divine. I personally would have a heart to excuse and forgive him for many mistakes/errors he might have made. My own evaluation is that he is doing better things than most of the people you guys like Nii and Ann want to field for us. I take the current opposition leaders like Ingabire (photo above) and others as examples. Apart from dwelling on divisionist and demonizing discourse, they don't seem to have any authentic ideas or a sound development agenda for delivering Rwandans from what appears to be the RPF's or Kagame's hegemony and management failure. What will these opposition leaders gain, apart from wrath from a powerful government, by engaging in whipping up ethnic animosity which a number of Rwandans are fed up with by now? Above all, what will they gain in internal politics (in Rwanda, I mean) when their fake cause is being advanced mainly by people like Nii and the like who can afford to cheat the world on a virtual forum like this but could probably find themselves dumbfounded in a face-to-face lecture or a public speech? Poeple like Nii should come to Rwanda and tell Banyarwanda what they can otherwise write on the Internet. People like Erlinder are brave, although I would refrain from calling him a hero, because he has dared to come to Rwanda even when he knew he was unwelcome due to the 'enemy' image he has carved himself of against not only the Rwandan Governnent but a number of Rwandans. I hope he enjoys the coolers for a while, and that way he will learn from the reality that he too is human like the people he tries to treat as 'objects' of his occupational exploits. God bless you all, and please tolerate my dissent if you don't mind. Dear Charles, I do really agree with your take. However, I disagree with you about a systematic mwirabura/mzungu (african/white) divide. Yes, the Mzungu was a colonizer and yes, most of the shareholder value of the big mining companies is in Wazungu pockets. Yet… I would refrain from deterministically using this dichotomy, just as I would refrain to deterministically use the Hutu/Tutsi dichotomy. It is through the acceptance that we are all humans that we understand that no matter what color you and your culture are, all can rise to cultural highs and all can fall deep to the lows of hatred and murder. Please, let us condemn ideologies which can befall just anyone and not ethnicities/nations/races. Hope you agree. Don't you tire siding with Genocidaires like Erlinder? As for now, it seems like Ann has "found" a hidden truth that has been viciously hidden from the world population (a big big bad conspiracy!) and as an anti-nuclear peace loving moralist soul she will "fight" for spreading this "truth". Mainly, she might have discovered that if she writes about an under-reported African issue she can push her journalistic career. After all it is not the "Middle East" which is saturated by "experts" like her. So wow, she is practically the ONLY journalist in the field! Isn't that an opportunity? Never mind she has probably never set her foot in Rwanda or met Rwandans of all political views. As I wrote in another post: If Ann goes on like this, she may well be the next Georges Ruggiu, the Belgian-Italian RTLM reporter convicted by the ICTR for spreading hatred. Ann, if you REALLY think you want to save the world, think again. So far you are shamelessly spitting into the faces of survivers and trampling on the graves of their loved ones. So think again please. It has NOTHING to do with approving or disapproving Kagame! Noooooo. I wrote about Ruggiu in the last article of Ann a few days ago. I am just wondering where in Nii's critique he talks about genocide? Those who are criticizing Nii keep bringing up the genocide. Where did you find that in the critique? Could someone refute the report instead? I personally think Nii hit the nail on the head. I am no journalist, but Nii's critique completes the original report in my opinion. PKagabo, please read between the lines. roni: I don't see anything between PKagabo's lines.